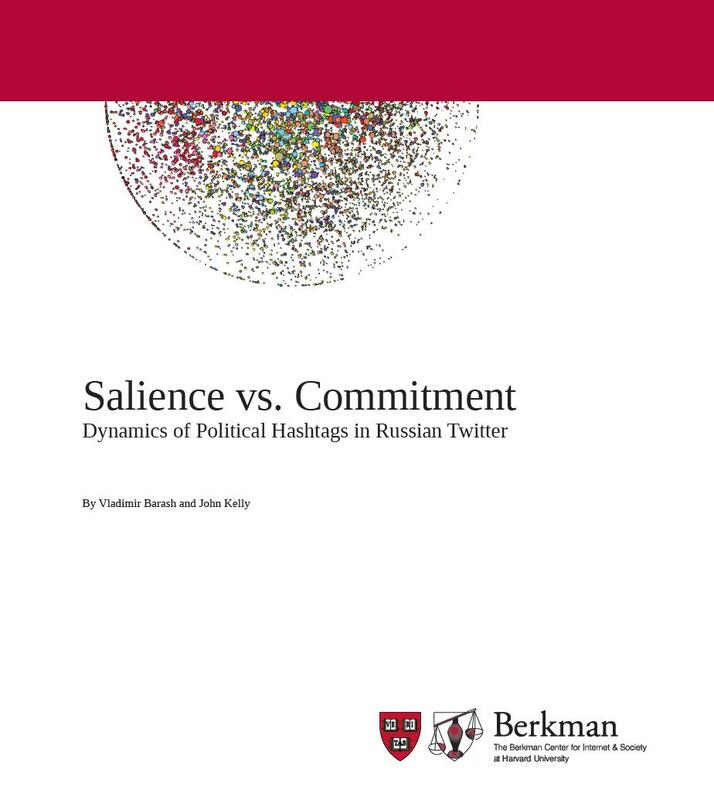 Building off our recent mapping of Russian Twitter, in this paper we analyze the dynamics of political hashtags representing a range of political issues and big news stories–from terrorist bombings, to pro-government issues, to topics preferred by the opposition. This work was made possible thanks to the generous support of the John D. & Catherine T. MacArthur Foundation. This is the fourth in a series of papers that will be released over the coming months. Previous research on the Russian Internet include our baseline network analysis of Russian Twitter, “Mapping Russian Twitter,” our study of the Russian blogosphere, “Public Discourse in the Russian Blogosphere: Mapping RuNet Politics and Mobilization” and “Exploring Russian Cyberspace: Digitally-Mediated Collective Action and the Networked Public Sphere.” An overview of past and upcoming publications can be found here: http://cyber.law.harvard.edu/research/ru…. 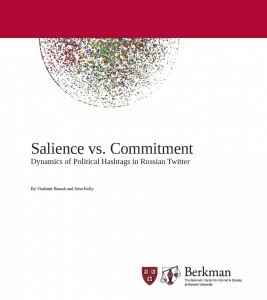 For further information about the Berkman Center’s project on the Impact of the Internet on Russian Politics, Media, and Society please visit: http://cyber.law.harvard.edu/research/ru…. Blogs are an integral part of the Arabic media ecosystem. We found that bloggers link to Web 2.0 sites such as YouTube and Wikipedia (both the English and Arabic versions) more than other sources of information and news available on the Internet. Al Jazeera is the top mainstream media source, followed by the BBC and Al Arabiya, while US government-funded media outlets like Radio Sawa and Al Hurra are linked to relatively infrequently. Most national media outlets do not have much reach outside of their respective national clusters. Returning to YouTube, we found that Arabic bloggers tend to prefer politically oriented videos to cultural ones. Videos related to the conflict in Gaza and the throwing of shoes at George W. Bush in Iraq are popular across the entire blogosphere, while clips related to domestic political issues are linked to more heavily by the various national clusters, such as Kuwaiti parliamentary campaign videos. While much has been made of Iraqi bloggers during ongoing debates about the Iraq war, this group does not figure prominently in the Arabic blogosphere. Rather, they are deeply integrated into the English Bridge group. This may be because many Iraqi bloggers write in English and have many inbound links from US think tanks, journalists, and partisan political bloggers (“Iraq the Model” on the right, “Riverbend” on the left, for example), rather than mainly writing for a domestic public. We also did not find any cluster of bloggers dedicated to violent extremism. 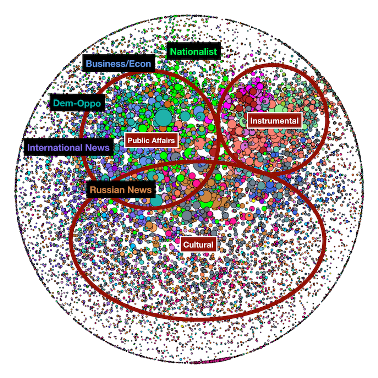 This week the OpenNet Initiative (ONI) released its 2009 report on Internet filtration across the Middle East and North Africa (MENA). Research for this release was conducted in 2008-2009, but it builds upon findings dating back to 2003, including a report released in 2007. The full release (available in PDF) chronicles the detailed testing of over 2,000 websites in each country. The ONI’s work on Internet controls in the region provides crucial context for the Internet & Democracy’s work on the networked public sphere. Back in June, the Internet & Democracy team released a study of the Arabic Blogosphere, authored by John Palfrey and Bruce Etling of the Berkman Center, and John Kelly of Morningside Analytics. 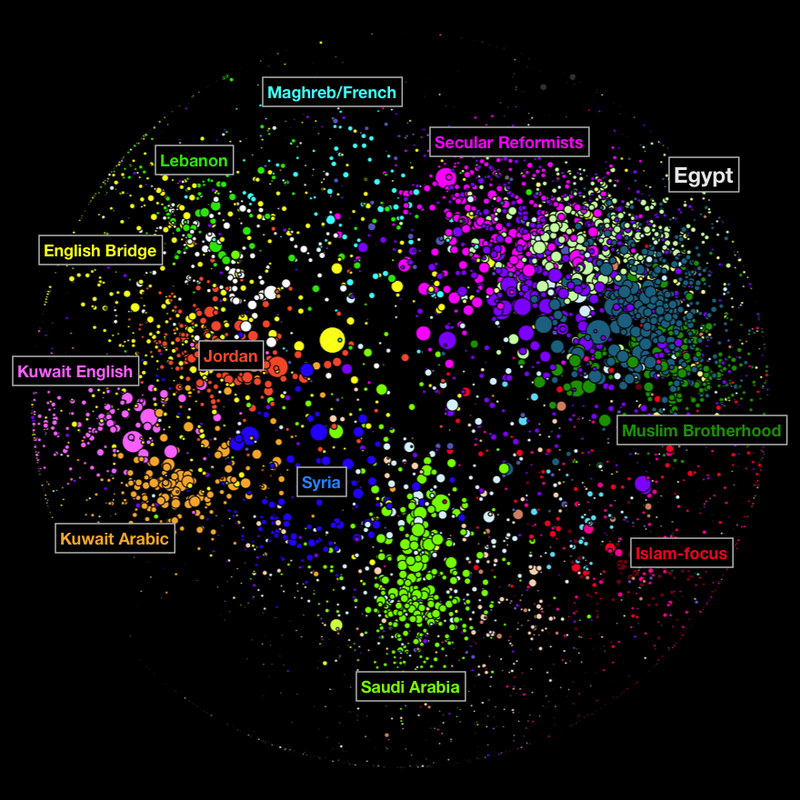 The research spanned 35,000 Arabic language web logs across 18 countries in the Middle East. A few weeks ago, the United States Institute of Peace (USIP) released the webcast, including the interpretations by three panelists Daniel Brumberg of Georgetown University, Acting Director of USIP’s Muslim World Initiative, Saad Ibrahim of Voices for a Democratic Egypt, and Raed Jarrar, a prominent Iraqi Blogger who writes Raed in the Middle. In June, 150 viewers from 26 countries –with the highest Middle East representation coming from Saudi Arabia, Egypt, Iraq, Syria, and Lebanon– watched the presentation of the Arabic Blogosphere study for at least 30 minutes, and many asked challenging questions of the researchers via Twitter and chat. The research findings proved not only illustrative, but also provocative. Saad Ibrahim of Voices for a Democratic Egypt, expressed a predominantly Egyptian perspective, highlighting blogs as indicative of youth perspective, and youth’s centrality in Egyptian demographics. He discussed the “electronic unveiling” of Saudi women, the protective “tribalism” displayed by Egyptian bloggers, and the fact that “Egypt today is the online voice of Iran.” Commenting on the study’s findings, Ibrahim declared that the Egyptian blogosphere is witnessing a new age, where “issues and technology” dominate the political online discourse, and where “bashing the U.S. is not a pastime” so much as an occasional necessity. Daniel Brumberg of Georgetown University and Acting Director of USIP’s Muslim World Initiative discussed the role of the Internet in “globalizing moderates, and marginalizing militants,” pointing out that bloggers were overwhelmingly critical of both extremist tactics and United States interventions. He discussed the importance of blogs in bridging between conflicting parties, noting that authoritarian regimes are usually less nervous about criticism inside “walled gardens” than cross-cluster talk. Beyond discourse, he elucidated the importance of political and social institutions, demographic understanding, and context to frame blogger perspectives. Raed Jarrar, a prominent Iraqi Blogger who writes for Raed in the Middle, critiqued some of the study’s findings. He maintained that the choice of many Iraqi bloggers to write in English is dictated by the political realities of “foreign occupation” rather than personal preference. He was additionally critical of the study’s research framework, taking issue with the parlance of labels such as “moderates” and “militants,” “secular reformists” and “Muslim Brotherhood.” Furthermore, he pointed out the “inherent bias” in investigating Arabic blogs’ support of “terrorism” or “extremism,” positing that “resistance” might be a more uniformly understood term for “terrorism” in the Arab world. He argued that the map would appear very different with re-framed parameters – for example, a different set of political categories could be seen across geographic or religious lines if attentive clusters were bifurcated by demographic understanding. Similarly, new patterns would emerge from categorizing bloggers by their political agenda rather than their religious affiliations. During the question and answer section, the study methodology was further elucidated, and the incorporation of Arabic speakers and regional experts explained. The researchers also responded to questions regarding shortcomings in the study’s choice of parameters and labels, emphasizing that their focus was primarily on understanding the digital discourse phenomenon, and providing a set of tools to study it. Categorizations will always be crude approximations of a reality far more complex than can be conveniently articulated – it is important though to be aware of these limitations and draw conclusions commensurate with such approximations. Several questions centered on the relation between the Arabic blogosphere and transnational and local media, and by extension, the connection between online life and real life in the Arab world. The researchers said it is hard to estimate the extent to which Arabic blogs reflect public opinions or consensus views, though they pointed out that Al Jazeera, the BBC and Al Arabiya are the top three mainstream media sources linked to by Arabic bloggers. In answer to the question “does online discussion distract from activism?” panelists called for a more careful analysis of who is blogging and who has access to the Internet. Jarrar for example stated that the Iraqi online discourse is “not mature enough to have its own mobilization.” Brumberg said that one of the biggest challenges ahead is to get bloggers to move to the public and political spheres. 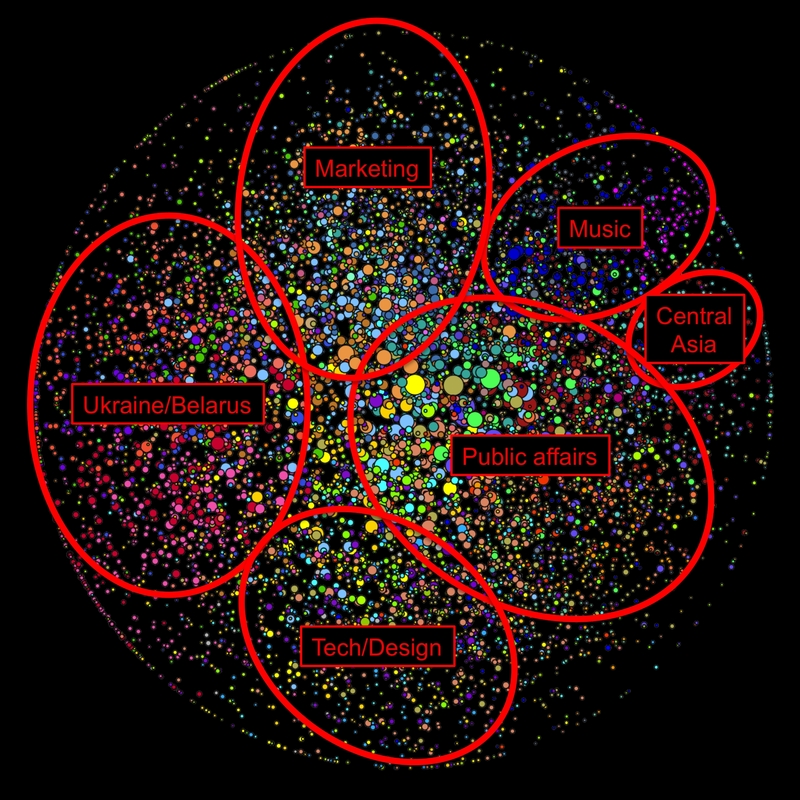 Participants wanted to know if the study’s findings could be read as evidence for the Internet Balkanization, as “similarly minded publics are being tied with similarly minded publics.” The national clusters that emerge in the Arabic blogosphere do seem to reflect an increasing focus on local issues. Others wanted to understand how this study compared with studies in the West, and if so whether the perspectives of the Western blogosphere matched Western social attitudes, questioning the assumption that online discourse can be extrapolated to understand larger societal trends. Yet others wanted to more comprehensively understand the linkages between online discourse and offline events, and how discourse percolated through and impacted the functioning of domestic institutions. Manal Dia, a Berkman Center Researcher & MIT graduate student, contributed to this post. * The Demographics of Arab Bloggers: Demographic coding indicate that Arabic bloggers are predominately young and male. The highest proportion of women is found in the Egyptian youth sub-cluster, while the Maghreb/French Bridge and Syrian clusters have the highest concentration of men. * The Makeup of the Arab Online Media Ecosystem: Bloggers link to Web 2.0 sites such as YouTube and Wikipedia (both English and Arabic versions) more than other sources of information and news available on the Internet. Al Jazeera is the top mainstream media source, followed by the BBC and Al Arabiya, while US-government funded media outlets like Radio Sawa and Al Hurra are linked to relatively infrequently. * The Perception of the United States: The US is not a dominant political topic in Arabic blogs; neither are the wars in Iraq or Afghanistan. However, when the US is discussed, it is nearly always in critical terms. There’s much more here — our study revealed other interesting patterns in the online discussion around extremism, and the online presence of political opposition groups, including Kefaya (Enough) and the Muslim Brotherhood in Egypt. You can get the complete study here. Also be sure to check out our event tomorrow at USIP where John Palfrey, John Kelly, Robert Faris and Bruce Etling will present the results and get reaction from a panel of experts and bloggers from the region. Looking forward to hearing your thoughts! The pre-voting stage in the first case study of the automated Swiss candidate-voter matching system, Smartvote; The voting stage itself in our second study on the implementation of electronic voting (e-voting) in Switzerland; The post-voting phase in our third study on the use of blogs by elected candidates in the Swiss government. It is important to note that this report marks a departure from our usual focus in the I&D case studies to date, where activity online was often assessed in conflict with the adversarial efforts of institutions to supress or resist. In contrast, these new studies examine an opposite scenario: a unique political environment in which institutions and networked technologies are actively working together in an effort to enhance democratic governance. We hope this piece will provoke lively discussion and broaden our understanding of the role technology can play among strong, established democracies. Enjoy! We’re looking forward to any comments or responses you might have. A major report released today from the Berkman led Internet Safety Technical Task Force shows that online predators are not the major threat to children that conventional wisdom would lead us to believe. While Berkman led the year long effort, the task force was actually composed of a phenomenal group of stakeholders including leading researchers in the field like John Palfrey, Dena Sacco, and Danah Boyd, a number of leading Internet companies including Facebook, MySpace, Microsoft, and Semantec, and several nonprofits working to keep children safe online. The task force was created at the request of 49 state attorneys general. Another interesting finding is that online bullying is probably the biggest threat to children online. For those minors that do fall victim to sexual predators via the Internet, the report states that it is not the Internet that is primarily to blame, since those youth are often already at risk due to a number of other “real world” factor like difficult home environments or substance abuse. According to the report, the best way to improve child safety on the Net is not necessarily a single ‘silver bullet’ technical solution, but instead continued education for kids on how to safely use the Internet and the involvement of parents in decisions about how their children use the Internet and the sites they visit. You can download the executive summary here, and the full report here. Back in February Harvard adopted a mandate requiring its faculty member to make their research papers available within a year of publication. Stuart Shieber is a computer science professor at Harvard and responsible for proposing the policy. He has since been named director of Harvard’s new Office for Scholarly Communication. « Older posts « Can Google Predict Election Winners?